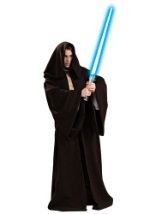 Ladies can be Jedi Knights too, with this plus size female Jedi costume. The apparel consists of a tan tunic, screen-printed belt and pants with attached brown boot covers. Feel the ways of the Force with this officially licensed Star Wars costume and add a lightsaber in case you run into womprats!